The new website DE SANGOSSE Brazil is online ! We are pleased to announce the launch of our new website ! 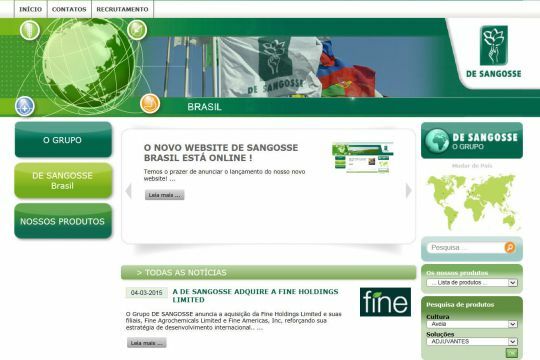 You will find all the relevant information from DE SANGOSSE Group but particularly from our Brazilian subsidiary : DE SANGOSSE AGROQUÍMICA LTD.
You will be also discovering our business activity and our various product segments. Do not miss our news to follow the current events of the Group and those of our Brazilian subsidiary ! We look forward to seeing you on our website www.desangosse.com.br ! The team DE SANGOSSE BRAZIL.